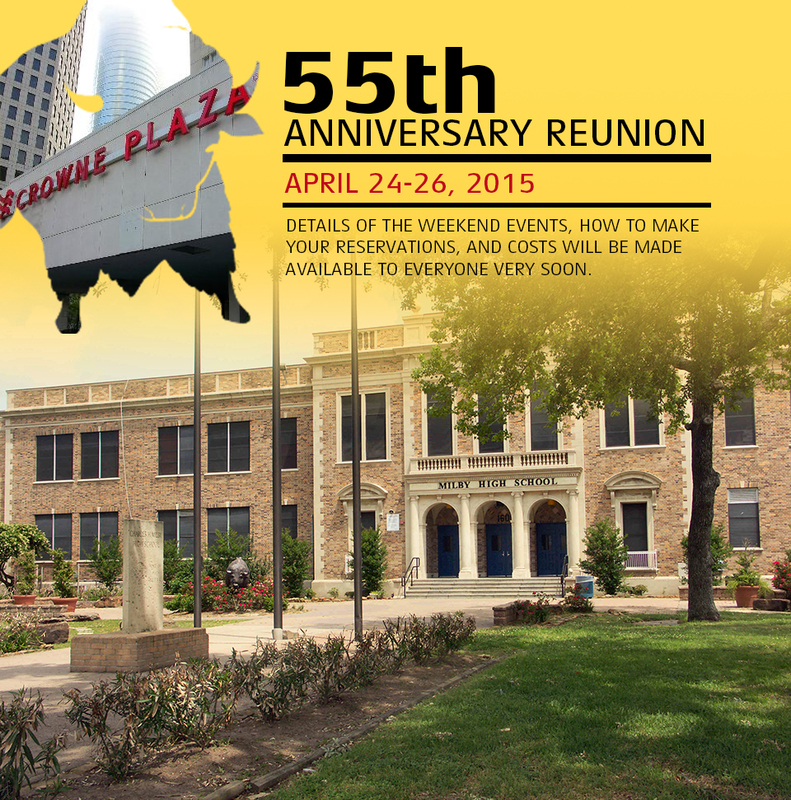 Please use the Paypal button to purchase your Milby 2015 Reunion tickets. I ABSOLUTELY LOVE THIS PAGE. I THINK IT’S JUST AMAZING. MOST IMPRESSED BY THE MANNER IN WHICH THE BUFFALO WAS INTEGRATED WITH THE CROWNE PLAZA DOWNTOWN LOGO — QUITE UNIQUE. Looking forward to our 55th. How exciting!!! Thank you so much to our wonderful, faithful, hard-working Reunion Committee!!! Can’t wait! Looking forward to another fun filled weekend with all of our classmates. I can’t wait. I have been looking forward to this since the last one.i wish that I could help in some way. Thank you to the committee for all that you do. Hard to believe that our old school looks so good. Hopefully all of us have aged so gracefully. Look forward to seeing all of you. LOVE that front page! One terrific job!! Well done, y’all. The new page looks great! Can hardly wait to see all of you again. Stay healthy & travel safely. Hugs across the miles! I’m not that old. Ha just kidding. Looking forward to the reunion and seeing everybody. Hail to thee, our Alma Mater—Hail thy gold and blue! I’ve been grazing through the old annuals that are online now. They show a Milby we have not seen in years, very lovingly and faithfully presented in black and white. The smiles, the clothes, the youthfulness – makes me SO grateful to have been a part of it. This reunion (2015) might be a last chance to see Milby before the ‘re-do’. My wife was in hospital for 50th so really looking forward to seeing all. Spending 10 years at Milby teaching Journalism and sponsoring yearbook and newspaper-the term annual is foreign to students- very old school-yearbook is now politically correct- I am trying to stay alive for the 55. God Bless All! As soon as I can find my folder on how to use PayPal I will try to do this. Writing a check is so simple but I realize I am a has been. All of your that work on this are greatly appreciated. I am not on the computer often enough to stay up with all the new gadgets. I still use the U. S. Postal stamps, write letters, and pay bills with checks. The web site looks fabulous, at least I think I am looking at the Web Site. THIS PIC STIRS MANY MEMORIES. I GREW UP WITHIN 2 BLOCKS OF MILBY AND PLAYED AROUNG THE BUILDINGS & SHACKS BEGINNING AS A 10 YEAR OLD. MY BROTHER GRADUATED IN 1953 & PLAYED BASKETBALL FOR HAL LAMBERT. AT THAT TIME, STEVENSON WAS PRINCIPAL & BAYLESS TAUGHT (?). I UNDERSTAND THE WRECKING BALL IS ON ITS WAY BUT NOT FOR THE MAIN ENTRANCE, HOPEFULLY. WALLY SISK WILL FILL US IN HOPEFULLY A WHILE LATER WITH MORE UP-TO-DATE DETAILS. Greetings, looking forward to joining everyone at our 55th reunion. See you there! I have gone online today and paid for our reservations for the reunion and we are really looking forward to seeing everyone again. My husband, Loyd, is already telling me to make sure I have a good pair of dancing shoes to wear for Saturday Night. See y’all soon! This webpage is wonderful! Thanks to the reunion committee for all your hard work over the years! I look forward to seeing everyone at the 55th……… so many fond memories and friendly faces! Hotel reservations made, registration sent in, looking forward to seeing everyone of you. Onward Milby! I would love to see all of you again but Lloyd and I both have eye problems and it is not safe for us to drive in Houston. When we travel places, we travel with the senior group from church or the council on aging. The picture of Milby is beautiful. It did not look that good when we were there. My hugs go out to everyone.